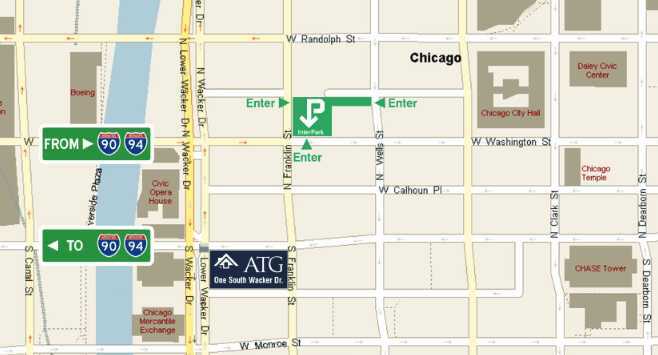 Discounted Parking Near ATG Chicago Office | Attorneys' Title Guaranty Fund, Inc.
Take an entry ticket as you enter the garage. Get your rebate validation ticket at one of the ATG reception desks. When you are ready to exit, go directly to your vehicle. Do not use the Kiosks to pay. At the automated exit gate, insert your ORIGINAL entry ticket. When prompted for payment, insert the REBATE validation ticket, then insert your credit card to pay discounted rate, and exit. Join our user group by contacting Lori Gallagher with your name and email address. (NOTE: ATG and subsidiary employees are already on the list.) When you receive email confirmation, begin with Step 2, below. Download the iParkit App from Google Play or the Apple App Store. Select SIGN IN from the app menu to Register today. Create your account with your email address, payment information, and the parking program code ATGF610. Add the iParkit Express Program. Scan your program pass at garage entry and exit gates. Located on the NE corner of Franklin and Washington. Enter on Washington (westbound), Wells (southbound), or Franklin (northbound).